Arriva Rail North workers to strike but what Calderdale routes will be hit? The proposed strike of Arriva North Trains will go ahead on Friday. A 24-hour strike on Arriva Rail North will go ahead on Friday after the failure of talks to resolve a dispute over the role of guards. 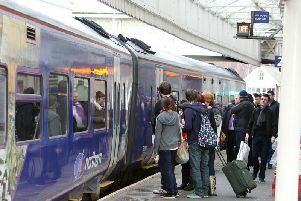 Members of the Rail, Maritime and Transport (RMT) union will walk out for the third time in a row over staffing for new trains due to come into service in 2020. The union said it was “angry and frustrated” that the company had rejected a proposal to invite Transport Department officials to join three-way talks in an attempt to reach a solution. Workers from Northern will join RMT members from across the country at a protest in Westminster on Wednesday against driver-only operation to mark the first anniversary of the bitter dispute on Southern Rail. RMT general secretary Mick Cash said: “The sheer intransigence of Arriva Rail North means that the action this Friday goes ahead as planned. “The responsibility for the inevitable disruption lies wholly with the company. “We are angry and frustrated that Arriva have thrown out a perfectly reasonable proposal to invite the DfT to join us in three-way talks aimed at finding a solution. “The public, who support RMT’s campaign for a guarantee of a guard on their trains, will be appalled that Arriva Rail North have failed yet again to offer any kind of progress whatsoever in the talks and have instead opted to try and bulldoze through their plans regardless. Richard Allan, deputy managing director of Arriva Rail North, said: “It is disappointing that RMT was unwilling to move from its current position during our talks. “Our employees want us to talk about changes we need to make to the on-board role as we modernise our railway. We believe we would keep a second person on many of our services and, at some locations, we may choose to staff the station to give better support to customers. “In addition to protecting jobs and current pay, we are also willing to offer future, annual pay reviews for existing conductors if we can agree a deal with RMT.